Of all the many sessions I’ve attended at the International Congress on Medieval Studies, one of the most enlightening was a workshop by Dr. Kristine Larsen of Central Connecticut State University that taught us how to use a medieval astrolabe. I will admit to only having a vague notion that astrolabes used stars for navigation, but I learned they have many essential uses such as telling time, predicting where the sun and stars will be at any time on any given day, and figuring out your location. They were the Swiss Army knife of medieval travelers. A helpful medieval instruction manual for learning how to use an astrolabe, and the focus of Larsen’s workshop, is Chaucer’s A Treatise on the Astrolabe, which he wrote for his son “Lytel Lowys” circa 1391 CE. (As Paul Strohm has written in Chaucer’s Tale, it is unlikely Chaucer lived with his sons for much of their lives, given his small lodgings in London, and his wife’s position in the household of Katherine Swynford, so writing may have ensured Lewis got the teaching his father couldn’t provide in person.) Like so many educational manuals that have come to us from the Middle Ages, A Treatise on the Astrolabe is as useful for teaching a room full of medievalists as it was for its intended audience. The back of the astrolabe, we learned, is designed to help determine the position of the stars on a certain date, using months, days, and zodiac signs as indicators. Turning the dial on the back to March 12 (the date Chaucer uses in one of his examples) indicates that the sky above is at the beginning of Aries. Once the position of the zodiac is determined, the astrolabe can be flipped over and its plate turned to find out the more practical details, such as when the sun will rise and set; what position the sun will be in at a certain time of day; how high the sun will be from the horizon; and how long the day or night will be. This is all determined from geometry: the time of the sunrise on March 12, for example, is when the line on the plate indicating the beginning of Aries intersects the horizon line on the surface of the astrolabe (in the section indicated as the eastern sky). The sun is not the only star that this works for, either. A medieval astrolabe can figure out the position of other bright stars, such as Vega and Sirius, using the same methods. 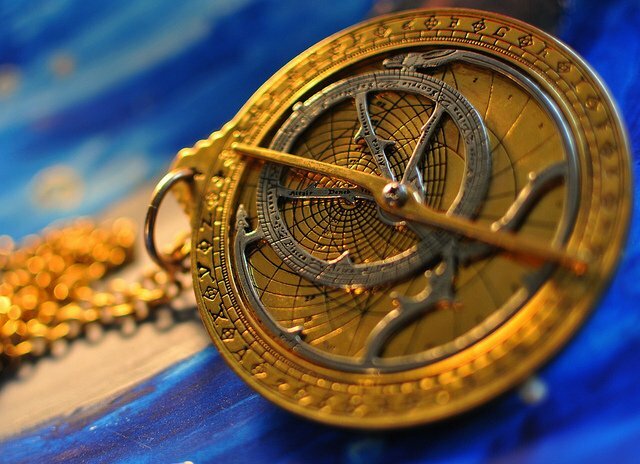 Celestial movements can be calculated from already knowing the date and location, or the astrolabe can be worked backwards to figure out what the date and location are. The advantage is, you never have to plug in or download a map; the disadvantage is that you need a somewhat clear sky. While Chaucer’s son Lewis may only have used an astrolabe to satisfy curiosity, astrolabes were vital to sailors who navigated out of the sight of landmarks, and for traveling Muslims who needed to determine the location of Mecca and the correct times to pray (incidentally, using an Islamic astrolabe is going to be Larsen’s workshop next year at the ICMS). Astrolabes at different latitudes required different geometry to make precise calculations, so travelers who intended long journeys north to south (or vice versa) carried several plates to switch out when they changed latitude. If you want to try making your very own astrolabe, James E. Morrison’s website has printable patterns for many different locations, including Chaucer’s Oxford. As Larsen mentioned in her workshop, bear in mind that Chaucer used the Julian calendar (not our current, Gregorian calendar), so there is a nine-day difference between Chaucer’s indicated dates and ours (for example, Chaucer’s March 12th is our March 21st). Adjusting the date will give you an accurate reading on your homemade astrolabe, just as it would have for Chaucer. As the weather in the northern hemisphere makes it much more pleasant to be out at night these days, grab your homemade astrolabe and Chaucer’s Treatise and impress your friends with your vast knowledge of medieval astronomy and ability to predict the sunrise. For Dr. Kristine Larsen’s next project – a book on medieval astronomy – click here.